On the same day that the rumour broke about Ross Brawn leaving Mercedes, another credible rumour engulfed the paddock when it emerged that Pastor Maldonado and PDVSA, the Venezulean oil company that sponsors the 28-year-old, are in the final stages of negotiating the deal that will see the one-time race winner leave Williams, the team he has been with since he entered the sport in 2011. Maldonado won the 2012 Spanish Grand Prix but has otherwise experienced a far from fruitful Formula One career, with his race win standing as his only podium to date. The long-awaited Williams revival has failed to materialised and it seems that Maldonado has grown weary of having to fight tooth and nail to simply make it out of Q1 during Qualifying. It’s believed that Maldonado is looking for a seat with Lotus, and hopes that his £20 million a year backing can help him into the Enstone based outfit. However, Lotus are currently in talks with another sponsor, who are untied to any driver, and securing this sponsorship would allow them to put Nico Hulkenberg in their car, instead of Maldonado. Other possible seats could arise at Force India or cash-strapped Sauber. Maldonado’s successful buy-in at Lotus would be good news for Felipe Massa fans as the recently redundant Brazilian would be given the option of a drive at Williams. There has been no comment from Mercedes as to the rumours that broke this morning regarding Team Principal Ross Brawn leaving the team at the end of the season. BBC this morning broke the story that Brawn was to leave, a story which has been developing since Paddy Lowe left McLaren for Mercedes in February. Andrew Benson, the BBC’s chief F1 writer, and Eddie Jordan, former team-owner turned BBC pundit were the two men behind the news, claiming that sources close to the team revealed that Brawn had failed to reach a contract agreement for 2014. Supposedly, Brawn wishes to remain the top man at the Silver Arrows but that can no longer be a possibility. If Brawn is to step down, the two executive directors, Toto Wolff and Paddy Lowe would step up to manage the political and technical aspects to the team respectively, while non-executive chairman Niki Lauda will also hold a position within the team. Mercedes have so far refused to comment, and say that they will continue to do so until the end of the season. Brawn was the driving force behind Michael Schumacher’s Ferrari championships, and took control of BAR Honda following their sudden departure at the beginning of 2009, renaming the team under his own name and driving them to a Championship in the team’s first season. Giedo van der Garde, Charles Pic, Mark Webber and Nico Hulkenberg were the four retirements from today’s Indian Grand Prix. Van der Garde, to start with, retired on the first lap due to damage he sustained from a brushing with a fast starting Max Chilton. While still on track, VDG took to the team radio to rage about Chilton (“again”), but once he had gathered his thoughts post-race, he had this to say, “I’m really disappointed my race ended so early. “I made a fair start but coming out of turn one Chilton left me no room and we made contact, breaking my front wing and suspension. It’s been made really clear to us that we have to give each other room but today I wasn’t given any at all and that’s what’s finished my race before it really got going. “After the start and coming out of turn one I was ahead of Chilton and my team mate. Giedo didn’t have anywhere to go and made contact with my right rear tyre and it punctured which meant I had to come in immediately for a stop. We’d started on the soft tyres so we were always going to have to stop early, but obviously not on lap one, and with the time I’d lost with the first lap puncture I was back to where we were in Japan, having to play catch-up for the rest of the race. “On the first set of mediums the car started behaving strangely and I was told to box again on lap 16. It turned out we had another puncture on the right rear and the tyre had lost a lot of pressure so we put on another new set of mediums and I pushed to close the gap to the cars ahead, but with such a big deficit it was always going to be unlikely I’d be able to catch and pass them. We gave it a go but we started losing hydraulic pressure, affecting the gearbox first, making changes harder, and then the steering started getting heavier and on lap 39 I was given the call to retire the car. Sebastian Vettel crossed the line to take his tenth win this season, and in doing so claimed his fourth consecutive Drivers Championship, with the Constructors Championship thrown on top for good measure. Here’s what Sebastian had to say post-race. “First of all I would love to say thank you to the crowds. It was an unbelievable reception today and it’s a shame we are not racing here next year. I’m speechless. I crossed the line and I was empty. I took ages to think about something to say. It’s one of these moments where you want to say so many things but you can’t. It’s been such a phenomenal season. I think the team and the spirit inside the team is so strong; I said it on the radio already – it gives me so much power. It’s a pleasure to jump in the car and go out for the guys and girls and try to give it all I have. The car was fantastic today. I didn’t think about the donuts before the race today – it just happened. My engineer directed for the usual procedure, but I said ‘not this time!’ There are so many people in the main grandstand, I just had to do it. I want to say a big thank you to the team – all the people behind us. It was for sure not an easy season and even though people on the outside thought we had it in our hands, I think it was difficult. It a was tough season for me personally, to receive boos even though we haven’t done anything wrong; to overcome that and give the right answer on the track and get acceptance makes me very proud. Sebastian Vettel became the youngest quadruple World Champion ever today by winning the Indian Grand Prix for the third year on the trot. His team-mate didn’t share his joy as RBR also clinched their fourth Constructors Championship, with Webber dropping from the race with an alternator failure. Alonso, the only man who could postpone Vettel’s Championship glory, sustained damage at the start and later got caught in traffic to finish out of the points in eleventh, while Grosjean battled from seventeenth to third. The parade lap came and went and the grid took shape as the five lights lit up above the twenty-two assembled drivers. Lights out and they jumped forward, Vettel keeping his lead into turn one with the Mercedes duo fending off Felipe Massa. Mark Webber clobbered the curbs and tapped Kimi slightly before correcting himself and then nicking Fernando Alonso’s front wing. Further down the grid, Max Chilton had an ambitious start and hit Van der Garde at the first corner, prompting the Dutchman to pull over and become the first retirement of the race. Alonso slowly fell back the grid whilst suffering from the damage and pitted on the second lap, taking a new nose cone and a fresh set of boots. Vettel, surprisingly, followed him into the pits on Lap 3 to swap his softer compound for the medium compounds to begin his chase after Mark Webber who started the race on the more durable tyre. Massa led the race at this point while Vettel began his charge from seventeenth. By lap 10, Webber held the lead and the fastest lap while Vettel was quickly gaining ground on the other RB9. With the aid of DRS, he breezed past the bulk of the grid before overtaking Sergio Perez and slipping into second place where he slowed down, safe in the knowledge that Webber, ten seconds ahead, would have to pit sooner or later and allow him back into the lead. Gutierrez served a drive-through penalty for a jump-start while Pic made a second pit stop for a second puncture, having suffered the first puncture on the first lap. The Frenchman now running dead last would later be the second man to retire from the race with an underlying ‘serious issue’ on the Caterham. Alonso was preoccupied with pushing past Gutierrez whilst Massa was fending off Nico Rosberg. Webber pitted and Vettel took the lead, although it wasn’t too long before he himself entered the pits to change compounds. And Webber followed him in, only the bones of ten laps after swapping to the softer compounds, to fit the medium tyre and begin his final stint. Vettel and Webber now held a 1-2, a position that would easily guarantee them their fourth constructors championship, but before long Webber’s car was once again giving up and he was told to shut the engine off, suffering from an alternator issue. If he had no luck, he would have no luck at all. Stewards launched an investigation over Grosjean and Gutierrez making one than one maneuver, but this amounted to nothing, as did an investigation over Hulkenberg and Bottas exceeding track limits. Although Hulkenberg survived the investigation, he didn’t survive a mechanical issue on the Sauber which saw him crawl in to retire with just four laps remaining. Raikkonen, Hamilton and Perez had a great scrap towards the end of the race for fifth place, but up front Sebastian remained unchallenged finishing thirty seconds ahead of Nico Rosberg as he crossed the line to claim his fourth consecutive World Championship and clinch the Constructors Championship for the team, again for the fourth time. Sebastian Vettel romped to yet another easy pole at the Buddh International Circuit on Saturday morning. The German was completely unopposed by other teams as he took his third consecutive pole at the Indian Grand Prix, while the only man who could potentially put up a fight, Mark Webber, was given the medium compound tyres and took fourth on the grid. The only other man in the top ten that set a fastest lap on the medium tyres was Ferrari’s Fernando Alonso, who is eighth on the grid, meaning Webber and Alonso will be sparring partners once the softer compound qualifiers make their first stop. The Mercedes duo of Nico Rosberg and Lewis Hamilton were seven tenths slower than Vettel’s time while taking second and third on the grid, while Felipe Massa in the other Ferrari was fifth. Kimi Raikkonen was sixth on the grid while his team-mate gambled on saving a set of soft tyres in Q1 – and failed miserably, becoming the big name to drop out of the first Qualifying session. On the plus side, the Frenchman will have plenty of fresh tyres to aid his attempted charge through the grid. Nico Hulkenberg was an impressive seventh for Sauber as he looks to have yet another strong Sunday to help secure him a seat on the 2014 grid. The McLaren boys, led by Sergio Perez, filled out the top ten. Daniel Ricciardo narrowly missed the cut in Q2 and lines up eleventh, ahead of Paul di Resta and Adrian Sutil for Force India. Jean-Eric Vergne was fourteenth in the other Toro Rosso, followed by Valtteri Bottas and then Esteban Gutierrez who briefly led Q1 with a very impressive lap. Nearer the back, Pastor Maldonado put his Williams behind Grosjean on the grid, while Jules Bianchi was the fastest back-marker ahead of the Caterham two of Giedo van der Garde and Charles Pic. Max Chilton was the slowest driver in the session and will line up twenty-second tomorrow. 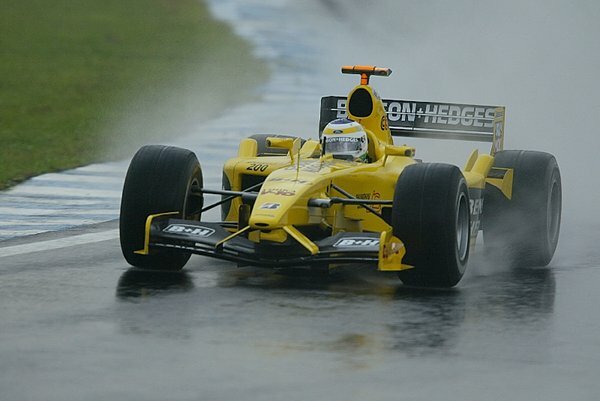 The Brazilian Grand Prix was the third round of the 2003 Formula One season. Local hero Rubens Barrichello had given himself the best shot at a home victory when he took pole position, taking full advantage of team-mate Schumacher’s worst Qualifying performance in sixty Grands Prix. Race director Charlie Whiting opted to delay the race start due to the wet weather conditions, and the race finally got underway behind the Safety Car. Barrichello led the procession of cars until the weather improved and the Safety Car pitted, but botched the race restart and lost the lead of the race to McLaren’s David Coulthard. While the McLaren romped off into the distance, Rubens fell back the order, Juan-Pablo Montoya and Kimi Raikkonen slipping past the Brazilian, followed by Michael Schumacher and an on-form Mark Webber who was producing a stunning performance for Jaguar. Nick Heidfeld was the first driver to leave the race, when the engine gave up on his Sauber. Justin Wilson, in his first race for Minardi, soon joined Heidfeld track-side when the tricky conditions saw him spin out of the race. On the next lap, Irishman Ralph Firman suffered a very scary suspension failure which saw him t-bone Olivier Panis’s Toyota and take both men out of the race. Kimi Raikkonen, in the other McLaren, soon caught and passed David Coulthard for the lead of the race while Antonio Pizzonia spun into the barriers at turn 3. Mere seconds later, he was joined in the barriers by Montoya who had been catching Raikkonen for the lead of the race before hitting a stream of water running through the Senna S section and losing control. The stream was also the cause of Michael Schumacher’s retirement, sliding off track and narrowly missing the tractor which was in the process of removing Montoya’s stricken Williams. Barrichello retook the lead of his home Grand Prix, the same Grand Prix that consistently denied him a home victory. And it looked like his Brazilian victory may come until his Ferrari’s fuel system saw him slow, allowing Kimi Raikkonen to retake the lead. Barrichello clambered from the cockpit, lamenting his ninth consecutive DNF at Interlagos, while Jenson Button and Jos Verstappen were also ending their races prematurely. Raikkonen now lead the race from the Jordan of Giancarlo Fisichella, before he too made a mistake which allowed the Italian to slip into the lead. On the next lap, Webber spun out of the final corner, hitting a guard rail and throwing debris across the track, ending his much needed strong performance for Jaguar. The yellow flags came out for Webber’s crash, but when Fernando Alonso came across the crash, he clipped one of the tyres which had bounced across the track, spinning into the barriers on the left before being rejected violently across the track and hitting the barriers on the other side of the track. Debris now covered the track and a winded Alonso needed the attention of the medical crew, so Charlie Whiting made the decision to red flag the race. With over 75% of the race completed, the race was ended. As Fisichella had led the race at the time of the red flag, it was presumed that Fisichella had won – his first win, and Jordan’s fourth. However, McLaren objected and claimed that as per the regulations, which state that a race ending red flag requires a two lap countback – i.e. the leader of the race two laps before the red flag was the race winner. While all this was being argued, Fisichella’s Jordan burst into flames in Parc Fermé. Eventually, Raikkonen was declared the winner, much to Jordan’s disappointment. However, only Raikkonen and Fisichella were on podium as third-placed man Alonso was en route to the medical centre with an ankle injury. Several days after the race, details emerged which suggested that Fisichella should have been handed the win. As he was starting his 56th lap, the countback should have gone back to the 54th lap – which he led. However, race stewards believed he was starting his 55th lap, which put the countback back to the 53rd lap – which Raikkonen led. The case was dragged to the FIA court in Paris on April 11th and it was deemed that Fisichella was the winner. At the next race in Imola, a ceremony was held where Ron Dennis and Raikkonen handed over the winning trophies to Eddie Jordan and Fisichella. It was to be Fisichella’s first race win, and Jordan’s last.